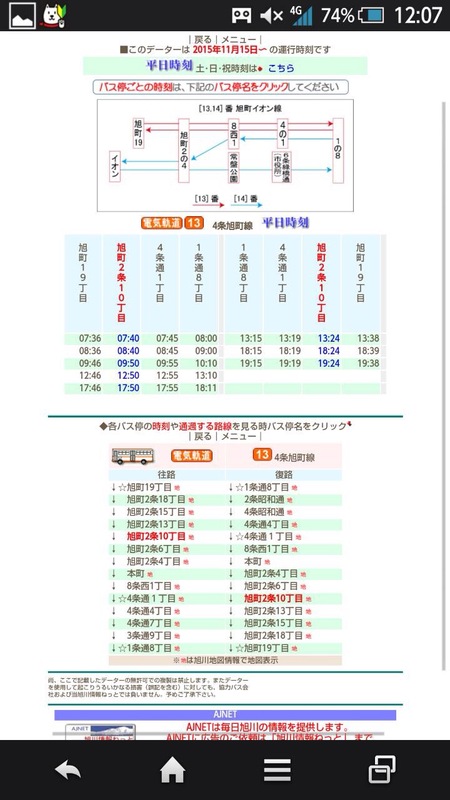 People living in Asahikawa sometimes have to go to city hall. City hall is a little bit far from this campus. 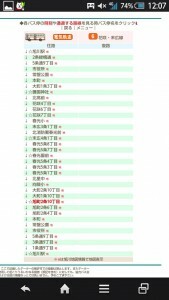 In addition, the route is a little bit complicated too. Furthermore, there are 2 bus stops near our campus! 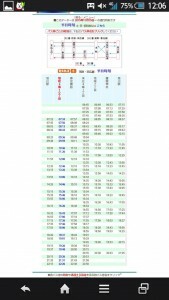 This article explains which bus you should take. 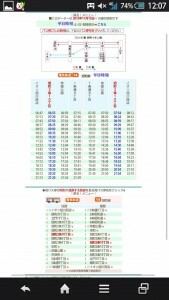 First I want to remind you that there is NO bus to City hall from 北門９丁目(Hokumon 9 Chome :which is the near the Gym) . 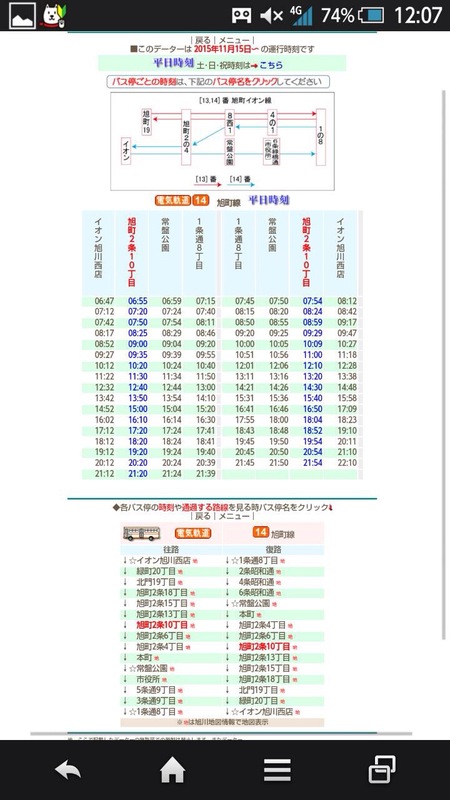 There are only buses from 旭町２条１０丁目（Asahimachi 2 jo- 10 Chome :which is the near the “Birthday”, the children’s clothing store). 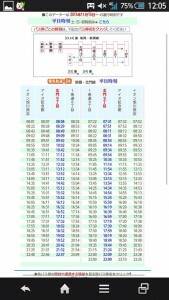 You should take the 旭川電気軌道(Asahikawa Denkikidou), not the 道北バス(Dohoku bus). 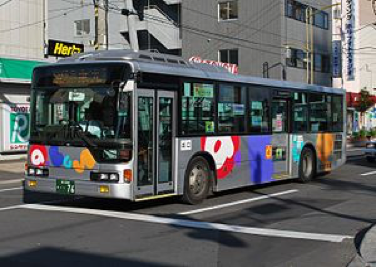 Usually, Denkikdou buses are RED, but sometimes they use a newer decorated bus. 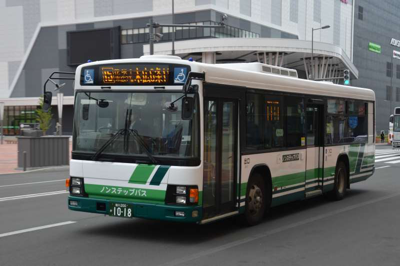 Dohoku buses are GREEN. 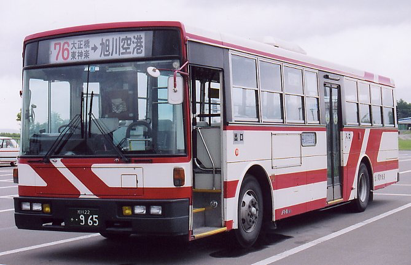 (Both are Asahikawa Denkikidou bus (旭川電気軌道). 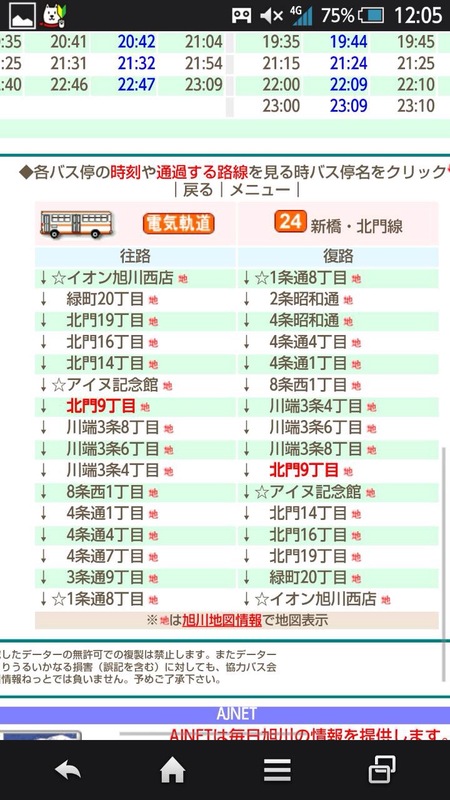 So far so good, but the No.13 bus of Denkikidou does NOT go to city hall, so you should check the bus number carefully before you ride the bus. 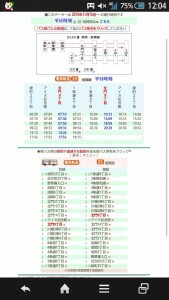 The bus fare from Asahimachi 2 jo-10Chome, one way fare is 190 yen, so if you have 380 yen, you can go there and come back. 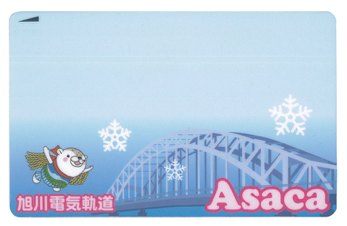 Or, if you have “Asaca” card and already charge the money in it, it’s easy to pay. You can buy it from vending machine in Nishi AEON or the Asahikawa Denkikidou office which is near the train station on Kaimonokouen. 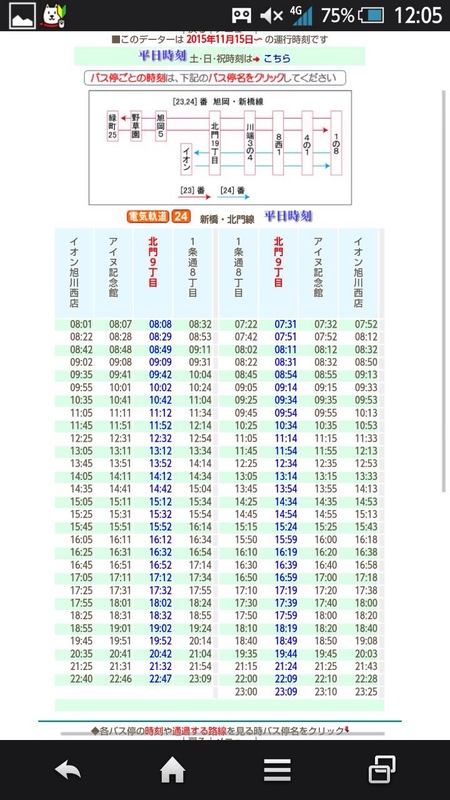 And, here is the time table of the bus from Asahimachi 2jo- 10Chome as of January 2017, so if you forgot the time when the bus will come, please make use of it. (But remember that they can change the time schedule). I hope this article was useful to you and that you can make it to city hall and back! Have a safe trip! Please leave me any comments or suggestions that you have. The winter in Hokkaido is often very cold – especially in northern Hokkaido, but there are strong temperature fluctuations.. And these fluctuations means that the snow turns into ice. In many cases, this will be “black ice” – the sort that you cannot see. So you have to be careful when you are walking around in Hokkaido. 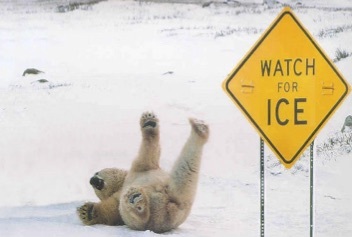 In this article, I want to give you some tips for walking on icy roads. The first way not to slip and fall is to walk using umbrella like a cane. 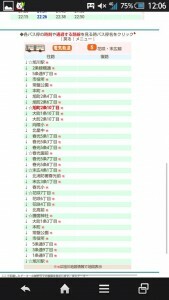 It’s easy to try this method and when it’s heavy snow, you can use umbrella. With this method, you’re killing two birds with one stone. 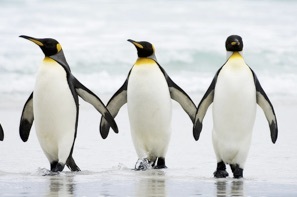 The second way is to walk like a penguin, this means do not lift the heels of your foot as you walk. Instead, stamp your feet as you are moving forward. By taking small steps, you make it so that you have less of a chance of slipping and falling. In addition, you should avoid the center of the sidewalk, because it is almost always the place with the most ice and therefore the slipperiest. The last way to avoid falling is to make your steps straight vertically. To do so, use your foot to grab the ground tightly and you might not to slip. Normally, we walk with a diagonal step where we are pushing forward as we hit the ground. 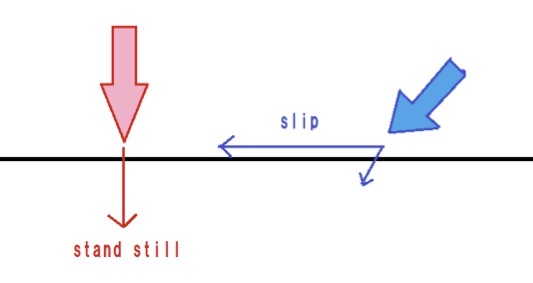 If you step diagonally on ice, you will slip to your front because your foot want to move forward. 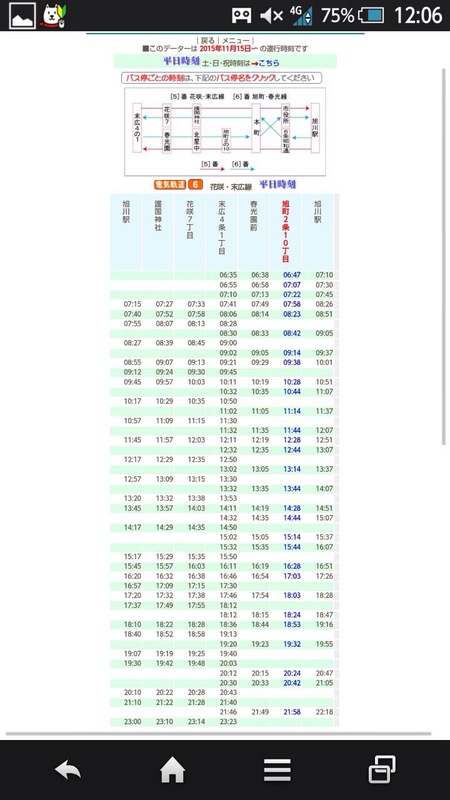 About the buses to and from H.U.E.A. 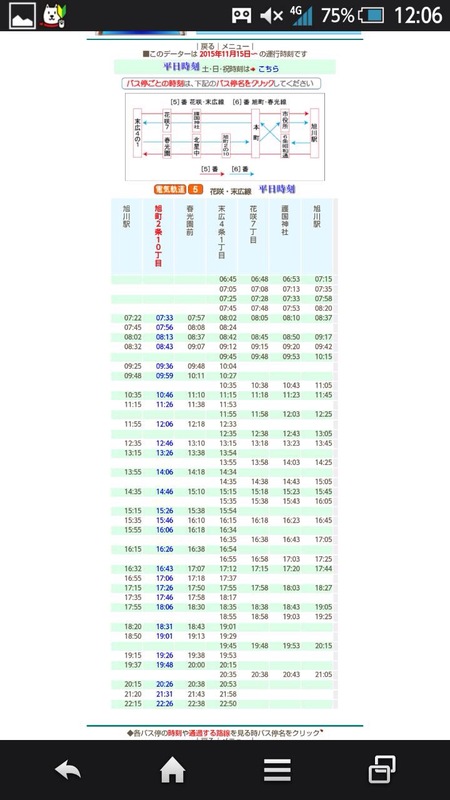 December 4, 2015 / 1 Comment on About the buses to and from H.U.E.A. This time I am writing about the buses that can take you to and from campus. I know a lot about this because I ride buses to and from school every day. (yaaaay = it’s not always run riding the bus every day). 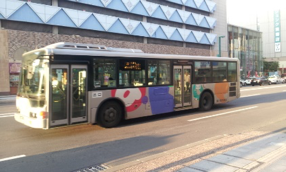 In Asahikawa we have two kinds of buses, because there are two bus companies. 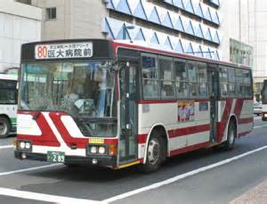 The other is “Dohoku Bus(道北バス)”. 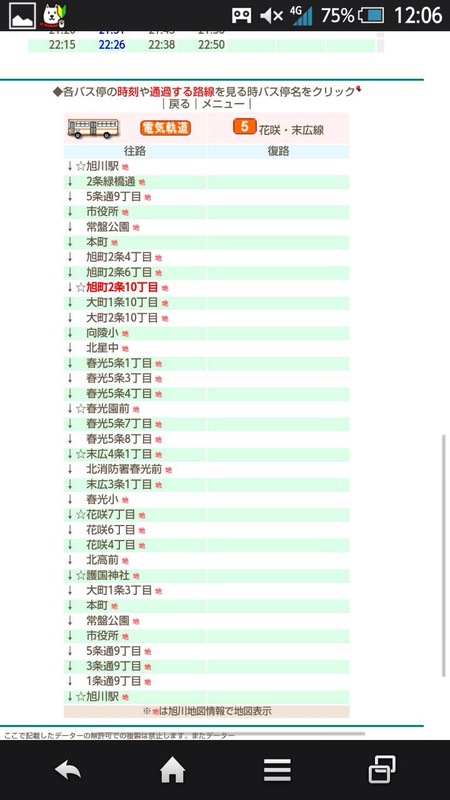 Neither has a good website in English. There’s way more ASADEN buses, so I am only going to explain how to use ASADEN. 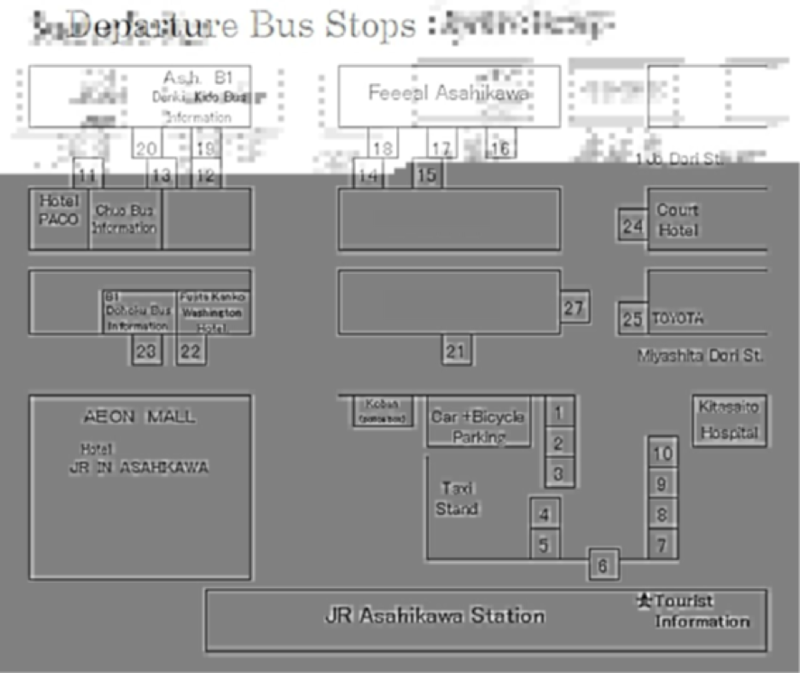 There are two main bus stops near H.U.E.A.’s campus. 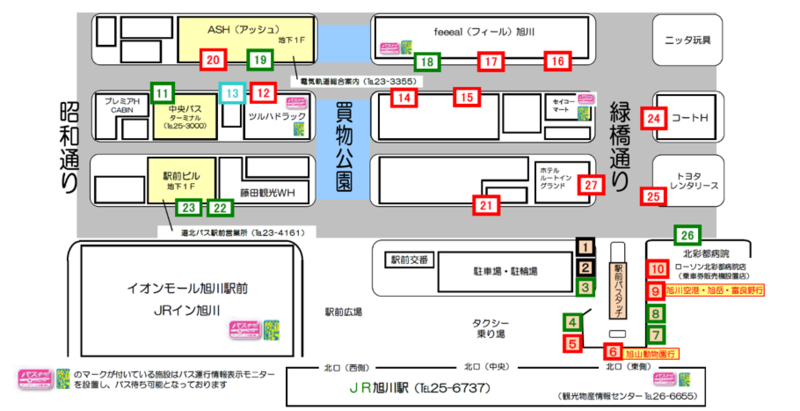 First , there is the Hokumon-chou 9-choume(北門町9丁目) bus stop is near education building. At this stop, we can catch the ASADEN #23 and #24 buses. Second, there is the Asahimachi 2-jou 10-tyoume(旭町2条10丁目) bus stop just north of campus. This is near L-building. At this stop, we can catch the ASADEN #5, #6, and #14 buses. 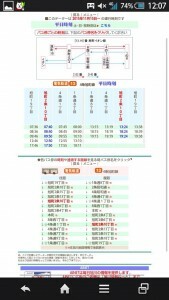 Taking buses in Asahikawa can be a little complicated. 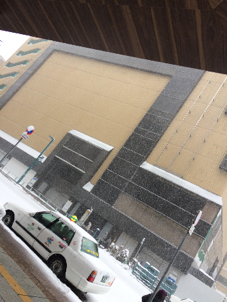 Moreover, Asahikawa has many snow and roads are freeze in winter. 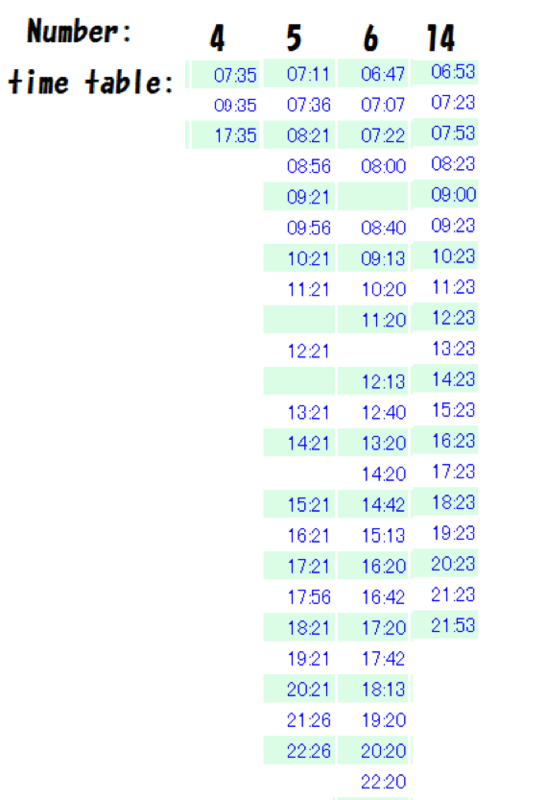 So often buses arrive 5-10 or more minutes behind schedule in the winter. Second, when you want to get off next bus stop, you have to push the purple switch to ask the bus driver to stop the bus. 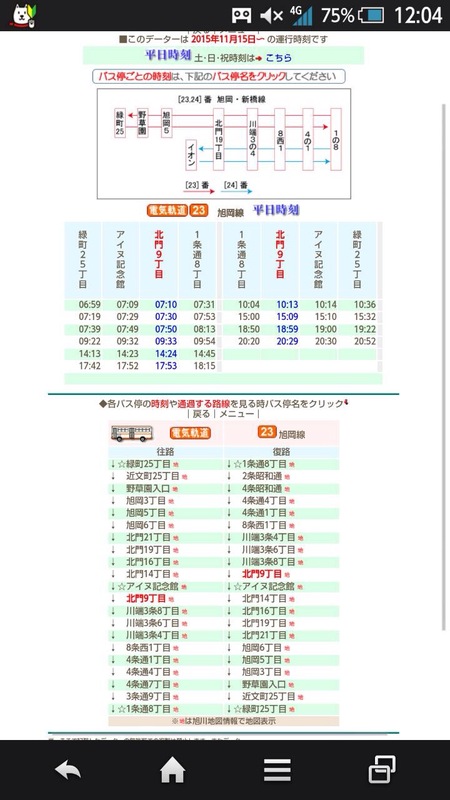 The information below is about the bus schedule as of November 15, 2015. 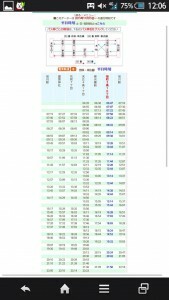 They change the bus schedule every six months.